The construction of a major tidal energy project in the Pentland Firth is set to begin later this year. Atlantis Resource's MeyGen scheme planned for the firth's Inner Sound has secured £50m in funding. More than £20m will come from the Scottish government and Highlands and Islands Enterprise (HIE). The UK government has given grants worth £10m. 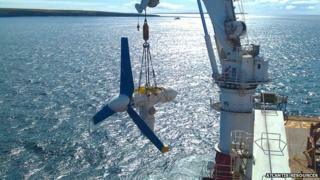 Atlantis said the completed scheme would have up to 269 turbines submerged on the seabed. The Crown Estate, which manages the UK seabed, has also invested £10m in the project, which would generate enough energy for 175,000 homes. The first phase will involve installing four turbines over the next two years. By 2020, 61 turbines could be installed and producing enough power for about 42,000 homes. Tim Cornelius, the project's director, said: "MeyGen is one of the most exciting and innovative renewable energy developments in the world, marking the long-awaited arrival of tidal stream generation as a serious, large-scale player in global energy markets. "I am proud that Atlantis will become the first company to successfully develop a project of this kind, at this size, making Atlantis the first independent power producer from a tidal array." The turbines will be installed in the Pentland Firth's Inner Sound, a stretch of water separating the Scottish mainland from Stroma, an island abandoned by its last inhabitants in the 1960s. Atlantis Resources has described the tidal conditions in the sound as "excellent". When fully completed, the 398MW, 269-turbine scheme will have the potential to power 175,000 properties. About 100 people would be needed to maintain the scheme. Scottish Energy Minister Fergus Ewing MSP said "innovative and exciting plans" were being brought to life. He added: "Our ambition for Scotland's emerging wave and tidal sectors remains great. "The Pentland Firth development takes our ambition to the next level and further cements Scotland's reputation as a world leader in deploying renewables technology." UK Energy Secretary Ed Davey said the project put Scotland and the UK "on the map as a global leader in marine technology". He said: "Meygen will be the biggest tidal stream array in the world. "Wave and tidal power have the potential to provide more than 20% of the UK's electricity needs, and Meygen could pave the way for future projects in the Pentland Firth." The Crown Estate's director of energy and infrastructure, Rob Hastings, said: "This is part of our strategy to explore the potential of tidal stream energy on a commercial scale with a project that offers a crucial stepping stone on the path towards unlocking the nation's tidal energy potential over the long term." Calum Davidson, HIE's director of energy and low carbon, said the MeyGen project was making a "huge step" forward after 11 years of testing and prototype development. He said: "The Inner Sound of the Pentland Firth has first class tidal resources, appropriate current speeds and crucially the site has good access to the grid. "In addition, the water depth in the area suits the extent of the project."